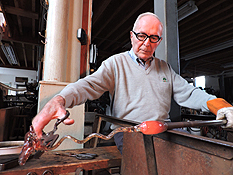 This is a unique and rare opportunity to create glass art at the furnace in Connecticut. 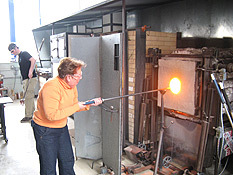 Under the guidance of experienced instructors, you will learn the many different ways of forming molten glass, including blowing and solid working. workshops designed to fit your needs. No experience is necessary. designed to accommodate all ages and for any sized group. 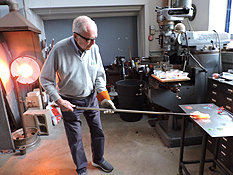 40 years of working with molten glass, my approach for teaching glass blowing is to make it a fun exciting unique experience for everyone involved. 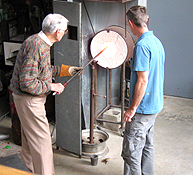 Each student will leave the studio with a special sense of accomplishment and a new appreciation of the process of working a ball of molten glass into unique finished piece of art. Make a glass flower or paperweight. Instructors will guide you through a hands-on experience twisting and pulling molten glass and sculpting it into a colorful glass flower or paperweight. This workshop is available to individuals or groups Tuesdays through Saturdays. Approximate time to make a flower or paperweight is 15 minutes each piece. No experience nesessary. Gift certificates are available.  Times: Tuesdays through Saturdays.  Fee: $48.00 Ages 7 years old and up. 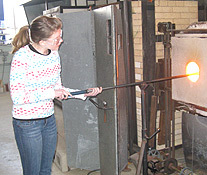 This workshop is designed to introduce students to the basics of blowing and manipulating hot glass. 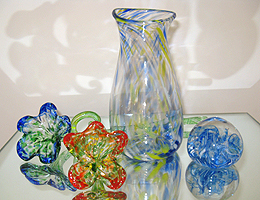 Students will create 4 pieces including a paperweight, glass flower and a blown vase. 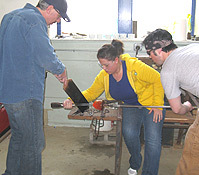 Instructors will demystify the principles of forming hot glass into finished objects. Duration of the 4 piece workshop is 1 hour long per person. This workshop is available to individuals or small groups ages 10 years old and up. No experience nesessary. Gift certificates are available. Ages 10 years old and up. The very first decorations in the form of a ball used for Christmas trees consisted of fruits (apples, oranges...). In the year of 1858, a severe drought effected all of Europe, and the apples and fruit fell from the trees. 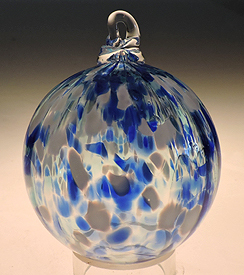 A glass blower from Goetzenbruck, a small village in the Moselle region of eastern France had the idea to blow glass balls as a solution to the loss of the fruit. 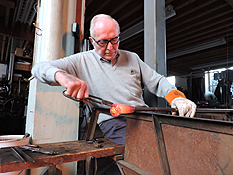 This glass blower created a tradition which spread throughout the world. This workshop is offered to companies that are interested in team building. 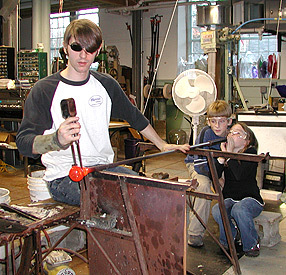 Under the guidance of experienced instructors the students will work as a team to make glass objects. 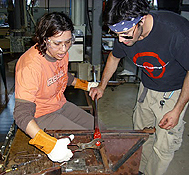 Each team will have the task to make a specific glass part. Each participant will rely on the assistance of their co-workers to make these objects. The students will have the option of choosing a specific color. This will help to identify the individuals work later in the finished sculpture. The colors provided could represent your corporate colors. 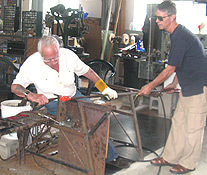 The goal of this workshop is to involve everyone in the process of making the components. 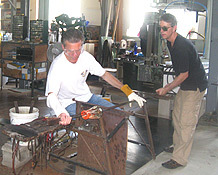 A team building camaraderie will form naturally throughout this glass blowing process. Three or more people at a time can work on one piece. 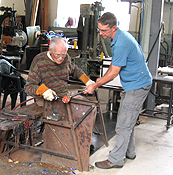 Below is Gene who is 85 years old making his first paperweight and retired surgeon John Martsolf who is 92 years old. Warren is 95 years old and making his first flower. Copy and paste the video links directly into your browser. 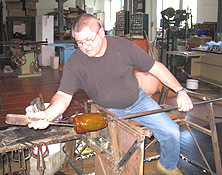 Online article about the glass studio. Safety is the number one priority. All students should know the risks of glassblowing. Glass blowing is inherently a dangerous activity. 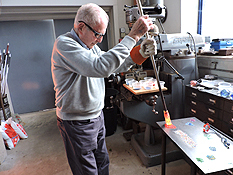 The following rules created by various studios and teachers, are meant to help keep the glass blowing experience as safe as possible. Be aware of your position in the studio. When you are walking behind someone, be sure to let them know that you are there. Students will be intensely focused on the piece of hot glass at the end of their pipe, please be aware of their potential movement. Do not swing a pipe in the direction of another person. Do not give the pipe a full swing no more than shoulder height. Never raise the blow pipe higher than your head. You should always move around the shop with the hot glass end of the pipe angled toward the floor. ALWAYS LOOK BEFORE TURNING AROUND WITH A HOT BLOWPIPE. 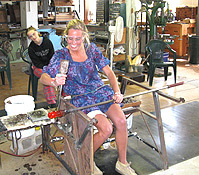 While blowing glass always be aware of any person in other areas of the studio. Safety glasses must be worn at all times. We will provide eye protection. If you have prescription eye wear or prefer your own ordinary sunglasses, please feel free to bring them. You are responsible for keeping your safety glasses on at all times. All classes will start with an explanation of the safety rules. Only authorized personnel are permitted to adjust studio equipment. If there are any problems, contact the the instructor. Do not wear synthetic material or plastic fiber. Proper dress should include a cotton long sleeve shirt with a short sleeve undershirt, long pants, closed toe shoes, no open toed footwear or flimsy shoes. Sturdy hard soled shoes are recommended. Do not wear metal exposed such as jewelry, metal buttons, watches, Etc. Individuals with long hair need to bring something to tie their hair back. 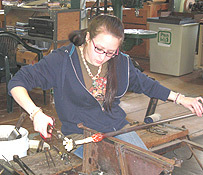 All students are required to read and sign a liability waiver and agree to abide to the standards of safety and conduct that Greenwood Glass Blowing Studio has outline. All students should know the risks of glassblowing. We attempt to run a safe shop, but cannot protect you from everything. Students under the age of 18 will require a parent or guardian signature on the liability waiver. Parents are encouraged to read and review safety procedures with their children. Link to liability waiver Please print, sign and send with your reservation fee. Otherwise the form will be provided. If a student must cancel and cancellation is received by phone 24 hours in advance of the scheduled day and time of the reserved class, there will be no fee. If no cancelation is made and the student or the group of scheduled students does not show up, the person that made the reservation is fully responsible to pay for the full value of that scheduled class whether it was for one student or for a group of students. If, for any reason it is necessary for us to cancel a class, and we are not able to offer another time, a full refund will be given if any deposit was applied to that scheduled class. If there is a major snow, ice storm, or power outage, the class will be postponed to another date. 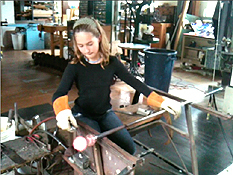 All students must be in good health and ability to withstand the heat and the physical demands of glass blowing. Please check with your doctor if you have any questions. Finished pieces must cool overnight. You will need to pick them up later, or if desired, we can ship them for a reasonable packing and shipping fee. We cannot hold your pieces indefinitely, so please pick them up promptly or make arrangements for shipping. We are not responable for students work that is left in the studio. Alcohol is not permitted in or outside of the Greenwood Glass Blowing Studio except during permitted events. The use of illegal drugs while at GGBS is strictly prohibited. We do not tolerate behavior that jeopardizes your safety or the safety of others. Do not blow glass if you have been drinking or have consumed anything else that would impair your coordination, judgment or balance. 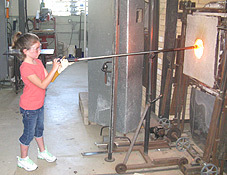 Students might receive minor burns or cuts as a natural part of learning to blow glass. 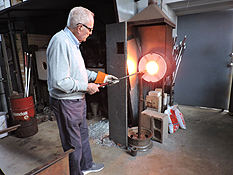 Many objects are hot, tools, pipes, punties, furnace doors, annealing ovens, assume that all surfaces are hot, even surfaces (such as the rails of the bench) that are not directly in contact with the glass. Report all burns and cuts to a staff member. We have a first aid kit available. All of these issues will be covered in the safety instructions at the beginning of the class. Shards and other pieces of unannealed glass can be extremely dangerous and may explode without warning. Under no circumstances should any piece of glass be removed from the studio unless it has been properly annealed. Shards and unannealed glass pieces will occur from the glass blowing process. These pieces of glass called drops are usually cut off from the piece that a student is working on. They rest on the floor and will retain their heat for many minutes. Please do not try to pick up this pieces. Instructors will dispose of them throughout the class. We blow glass in teams. The person making the piece is in charge of the team and is known as the Gaffer. The two assistants help the Gaffer by getting pieces of glass, arranging tools, providing bench blows, etc. Gaffers will not always need 2 assistants, allowing time for one assistant to rest. Team members should take care of each other. Help your fellow students to follow the rules of safe behavior and not work beyond their abilities. Never place a pipe in water without capping the end. If you forget to do this, a column of ultra-hot steam will surge up the pipe, and burn your hands or you'll be scaled with flying boiling water. 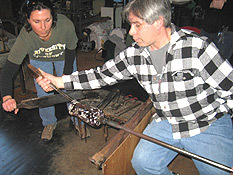 The Gaffer and assistants will take turns blowing on the pipe during the course of a piece. If you are uncomfortable with this communal contact, the best remedy is to purchase your own blowpipe and use a blow-hose. We clean the pipes between classes, but not each time that a student uses it. We have alcohol-based wipes to use on mouthpieces if you so choose. Please inquire with your instructor. Greenwood Glass is not responsible for the security of property belonging to students, instructors, or staff. Students are not permitted to have pets with them while at the studio. Greenwood Glass and its associates reserve the right to photograph, on site, students and their artwork for public relations work in promoting GG and its programs. Greenwood Glass does not discriminate on the basis of race, age, religion, gender, national or ethnic origin, or sexual preference. We purposefully do not teach gathering at the beginning of the class for several reasons. First, most students are intimidated by the heat of the furnace. Secondly, we want you learning the other skills on relatively symmetrical gathers (your first gathers won't be this way). Finally, the furnace is fragile and must never be hit with a gather of glass. We will teach you to gather as your skills warrant. The furnace holds 210 lbs of glass in a free standing crucible at 2000 F. It runs continuously and is very fragile. 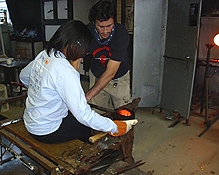 Students need to receive special instruction before removing glass from the furnace. Glory Holes are used to re-heat glass and run at a temperature of 2200 F. The doors are fragile and should be operated only with care. When you accidentally drop a piece in the glory hole, use the pipe or punty that it fell off to immediately retrieve as much of the piece as you can. While re-heating your glass object, pay particular attention to avoiding collisions with the doors. The main work area, the bench combines two areas: a seat with rails and a tool stand. The bench is setup for right-handed people. Lefties will need to learn to blow glass right-handed. Both hands are important and do different things. Although benches can be set up right or left-handed, most benches in the world are right handed. Annealers (aka Lehr ovens) are used to safely cool glass from final temperature (960 F) to room temperature. Annealer doors are fragile and must be closed slowly and firmly. Beware, their surfaces can get very hot. Glass will not stick to cold objects, it is necessary to preheat pipes and puntys. A pipe is hot enough when it has a very slight glow. Do not use a pipe that has not been heated as bits of glass on the end may explode violently when rapidly heated. Color ovens contain colored glass. 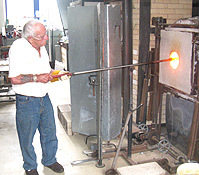 Color glass will crack unless preheated to 1000 - 1100 F.
The marver is the most powerful method of shaping glass and also the most difficult to master. When marvering glass, remember to support the weight of the piece and only allow the area you are working to touch the surface. The marver is an excellent tool for shaping and removing heat from an area of the glass. Marvers must be keep clean. Never set any object (especially a wet object) on a marver. It is a good habit to wipe the marver down before each use. When a hot bubble is inserted in an optic mold and inflated, the profile of the bubble is distorted into optic ridges. Used for decoration on both clear and colored vessels. Wooden spoon-like "blocks" are used only to shape very hot glass (usually fresh out of the furnace). Blocks should not be used on glass that is not moving as they will simply scum the surface and damage the block. Blocks should be used wet, but not with pools of water inside. If a block begins to smoke, rather than steam, immediately re-wet it. Paddles are used primarily to flatten the bottoms and lips of pieces. They do not need to be wet. 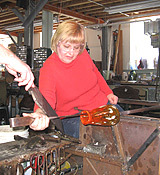 This versatile tool for shaping glass has two working surfaces, the blades and "backs" (the flat section near the bend). Assume both are hot and only grab the jacks by the handles. A pacioffi is basically a jack with wooden blades and needs to be kept wet. Metal jacks should have a fine coating of wax on the working surface. Tweezers should be free of wax and are used for any number of activities: "plucking" the glass, guide puntys into place, etc. A thick layer of wet newspaper will protect you from the glass even straight out of the furnace. Newspaper and graphite pads should be treated like blocks and always used wet on moving glass. Purpose of the paper or graphite pad which is held in ones hand, is to shape the hot glass. 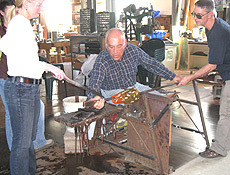 Shears are used for cutting glass. Straight shears are used like scissors to slice through glass and diamond shears are used to cut to a single point. NEVER use shears on cold glass. If you catch yourself using much force with shears, the glass is to cold to work and most likely you will damaging them. 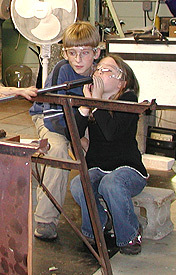 Blowpipes are provided for student use. Shop pipes should be treated gently, especially when hot. They will bend with excessive force. Our pipes have fancy plastic mouthpieces rather than the traditional metal. This is for safety reasons as plastic is much less likely to knock your teeth out. The plastic pieces are more delicate and scratch easily especially when spun on the floor. If you are inverting a pipe, protect the mouthpiece by spinning it on your shoe (not a beginner technique). Puffers, either bent or straight, are used to inflate a blown vessel while it is on the punty. "Steam sticks" are wet wooden cones and have a similar function.